The wisdom teeth may be blocked by the tooth in front and unable to erupt fully. It may be tilted. This may cause some sensation of pressure on the tooth in front. Occasionally the tooth in front may be pushed out of alignment and becomes titled too. It may be difficult to clean or brush the space between the wisdom tooth and the tooth in front. This may result in food trap, causing painful gum infection and swelling. Tooth decay may develop on the wisdom tooth and on the tooth in front. If left untreated, the tooth decay may worsen and result in severe toothache, which may sometimes require the need for root canal treatment or even extraction. 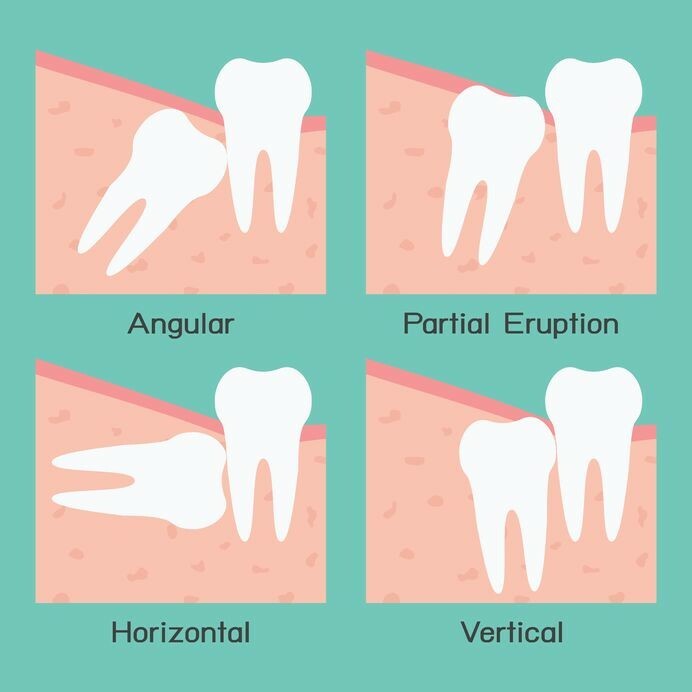 The opposing upper wisdom tooth may bite on the soft tissue or gum overlying the lower wisdom tooth and cause severe discomfort. Your dentist will advise you on the cause of your pain related to your wisdom tooth and advise you on the relevant options. Prescribe medication to control the infection. Discuss the long term management of the wisdom tooth which may involve surgical removal of the lower wisdom tooth. Usually the upper wisdom tooth may be indicated for removal too. An impacted wisdom tooth will require surgical procedure for removal. It is usually performed in the clinic under local anaesthesia, so the procedure will be painless. The gum and soft tissue will be pushed aside to expose the wisdom tooth. The wisdom tooth will be divided into smaller parts to be removed. It is normal to experience mild sensation of pressure and some drilling noises may be heard during the procedure. The gum and soft tissue will be stitched back and the stitches will remain in the mouth for about one week. Your dentist will prescribe some medication that will help to prevent infection and to reduce the pain following the operation. Your dentist will see you one week later to review the healing of the wound, and to remove the stitches. How should I prepare on the day of the surgery? Continue to clean the wisdom tooth and the adjacent tissues well. Unhealthy gums or presence of infection may hinder the proper healing of the surgical wound. Make arrangement for about 5-7 days of absence from work/ school. Have a light meal before the dental appointment and dress comfortably for the dental visit. If you are feeling unwell, inform the clinic early to make alternative arrangement if necessary. Arrive slightly earlier before the appointment time for administrative work e.g. registration and Medisave claims. Update the clinic on any drug allergies or medical conditions that you may have. You may wish to arrange for a family member or friend to accompany you home after the surgery. You may experience numbness and discomfort at the surgical site from the local anaesthetics for a few hours after the surgery. You may experience some bleeding, pain and swelling related to the surgery. It is normal. You will be given some cotton gauze. Bite on the gauze firmly to apply pressure over the wound for 30 minutes to 1 hour to stop the bleeding. Mild oozing of blood from the wound is not unusual. Do not spit or gargle too vigorously. If the bleeding is profuse or abnormally excessive, consult the dentist. Try to keep your mouth clean. Brush your teeth as normal. Go on a soft diet. Avoid sugary food stuff and alcohol. If the stitches were dislodged accidentally, inform the dental clinic and seek for advice. Surgical removal of wisdom teeth can be covered by Medisave at our clinic. Please check with the staff for further details.